5,300 Km of roads, 1,700 bridges, 473 Km of rail tracks, 180 Km of navigable waterways, 120 Km of tram lines and 73 Km of motorways, distributed in a 891.7 Km2 area. Berlin has more bridges than Venice and more waterways than Amsterdam, Stockholm and Venice combined! 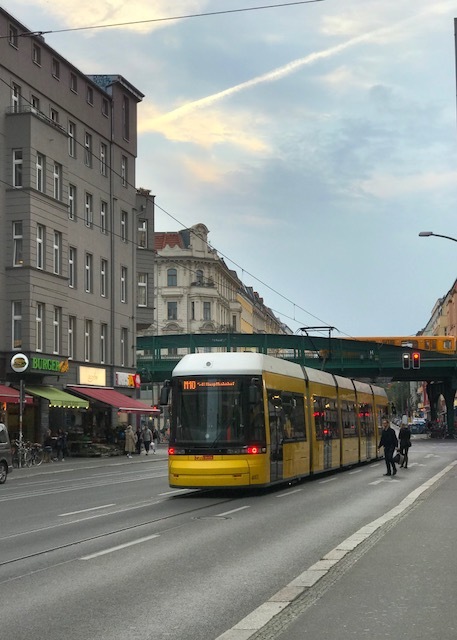 But don’t panic: The Berlin public transport infrastructure is comprehensive, efficient and provides great mobility around town and its outskirts. It is possible to arrive in Berlin by airplane, train, bus and car. All the airports, train and bus stations have connections to the public transport network. While the Berlin Brandenburg airport (BER) remains under construction (most recent estimates have it opening on October 2020!! ), Berlin is served by two airports. Whether you arrive at Tegel (TXL), in north-west Berlin or at Schönefeld (SXF), located outside of Berlin, in the south-east city limits, you can easily reach your place of stay, since both airports are very well integrated to the public transport system. Tegel is conveniently situated approximately 8 Km from the city center. In operation since 1960, the main advantage of this airport is that the boarding gate is just behind the check-in counter designated for your flight! So you don’t have to cross crowded duty free alleys to reach your boarding gate. However, Tegel is not connected to metro or train lines. You will need to take a bus to get to the rail network. The bus stops are located right outside terminal A and B. There are express bus lines that stop only at the main bus stops. The TXL bus line connects the airport to the S-Bahn circle line (Beusselstrasse Station), to the main train station Hauptbahnhof and to Alexanderplatz. The X9 bus line reaches the train station Zoologischer Garten in 20 minutes. The 128 line takes you quickly to the metro network, stopping at the metro stations Franz-Neumann-Platz (metro line U8) or Kurt-Schumacher-Platz (metro line U6). The buses run in a 5 to 10 minute-frequency. But attention: the buses run from 4h30 until midnight. For late night flights, you will need to take a taxi on the terminal A. 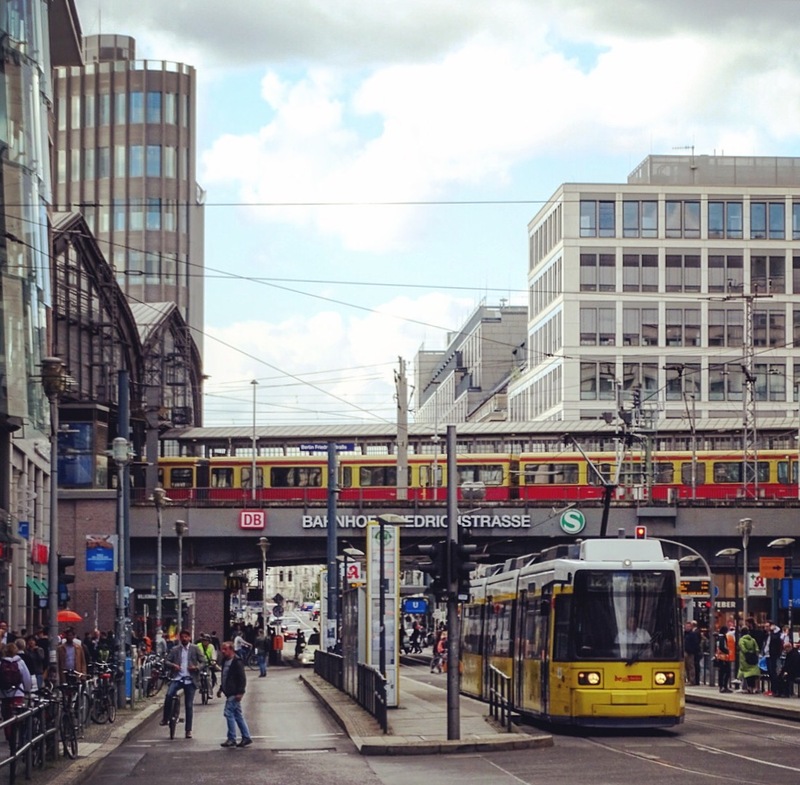 It will cost you about 25 euros to reach Alexanderplatz or 20 euros to get to Kurfürstendamm. Schönefeld airport has a railway station connecting to Berlin’s center. The station is located outside the airport terminals and you will have to walk about 10 minutes to reach it. Just follow the signs. SXF (Schönefeld) is situated approximately 18 Km from the city center and is linked to Berlin by the S-Bahn (suburban train) lines S45 and S9 and other AirportExpress/Regional trains that run from/to Hauptbahnhof (main train station), Zoologischer Garten, Friedrichstraße, Alexanderplatz and Ostbahnhof every half hour. The S-Bahn trains take 45 minutes to the city center and the express trains take 15 minutes from/to Ostbahnhof or 30 minutes from/to Hauptbahnhof, for example. The S-Bahn trains run every 10 minutes and serve the eastern ring line (S9) via Ostkreuz to Pankow and the southern ring line (S45) to Südkreuz station. There is also an express bus line – X7 – connecting Schönefeld to the metro station Rudow, in southeastern Berlin. The commute takes about 15 minutes. And good news for the late night travelers: the night bus N7 (that crosses town from Southeast to Northwest) has been extended until the Schönefeld airport and departs every 30 minutes. And, of course, from or to the airports, you can also book an airport shuttle, take a taxi or hire a car. Get a few app ideas to download from our friends at The Culture Trip HERE. If you are worried about your carbon print, train should be the best solution to reduce the impact of your journey on the environment. Long-distance rail lines connect Berlin with all of the major cities of Germany and with many cities in neighboring European countries, like Prague, Vienna, Zurich and Varsaw. 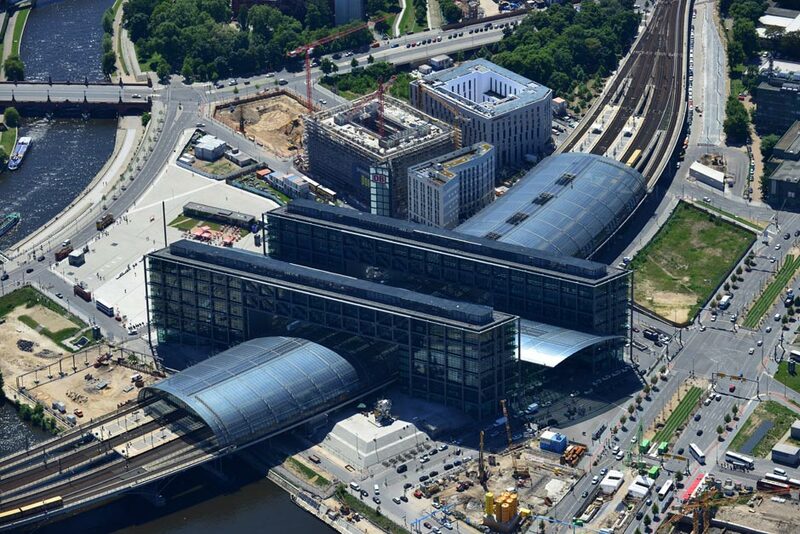 The central station – Hauptbahnhof -, in the middle of the city, is the central hub for all rail traffic in the capital. 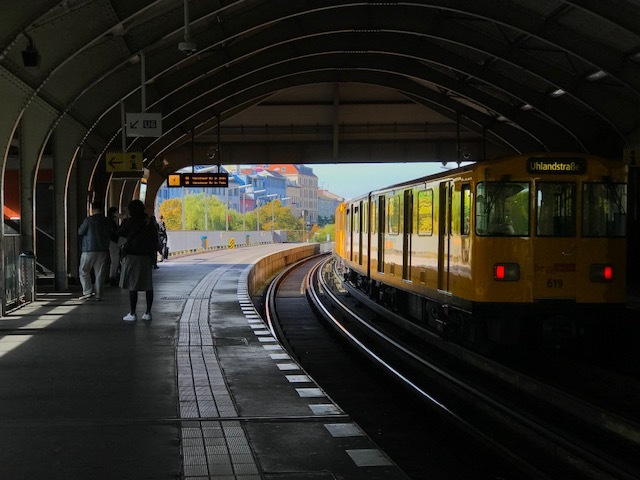 Other train stations, like Gesundbrunnen, Zoologischer Garten, Ostbanhof or Friedrichstrasse are also arrivals/departure stations for train trips and are all well connected to the public transport system. 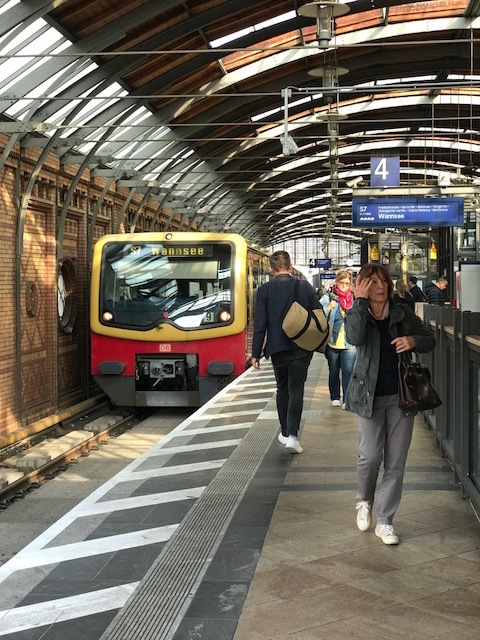 You might be tempted to take a regional train if you want to cross the city from Ostkreuz to Zoologischer Garten or to escape to a lake or even Potsdam, for example. Keep in mind that, within Berlin, regional services stop less frequently than S-Bahn services, especially where they run parallel to U-Bahn or S-Bahn lines. So if you need to drop off at an intermediate station/location, you might want to take the subway/bus/tram system. Arriving in Berlin by car is simple: the city has a good connection to motorways, that lead to several wide and big avenues on the direction of the center. Parking the car is not a problem either. There are spots for parking on the streets and multi-storey car parks in the inner city. But some parking zones in Mitte, Prenzlauer Berg or Charlottenburg require a ticket, that you can buy in one of the parking meters. The area of Berlin inside the train circle line (Ringbahn) is an environmental zone and you need to get your car a green sticker, certifying that your vehicle obeys emission standards and is allowed to be driven around this area. More on that HERE. Travelling by bus is the cheapest – and also the slowest – way to get to Berlin. National and international coach services to Berlin arrive and depart at the central bus station in the Charlottenburg district. Known as the “ZOB” (Zentralen Omnibusbahnhof Berlin), this station is reachable with a 3-minute walk to/from the S-Bahn station Messe Nord/ICC, that connects to the circle line, or to/from the metro station Kaiserdamm (U2 Line). Some intercity buses also stop at various other points in Berlin, including the airports and major railway stations, making the arrival at your final destination easier. Now that you know the various ways to get here, let’s understand the Berlin Public Transport System. The public transport system in Berlin is a network of trains/subways (S-Bahn and U-Bahn), trams and buses and it is divided in three different fare zones: A, B and C.
The A zone is the area inside the circle line (Ringbahn, that forms a circle around the inner city). The S41 moves clockwise and the S42 anticlockwise; the B zone is the area between the circle line and the city borders, and the C zone is the area located outside Berlin, including Potsdam and the Schönefeld airport. Berlin is a part of the VBB – Verkehrsverbund Berlin-Brandenburg (Berlin-Brandenburg Transit Authority). Ticketing and fare systems of Berlin and the surrounding state of Brandenburg are thus unified. The BVG (Berliner Verkehrsbetriebe) is the main public transport company of the German capital. It manages the city’s U-Bahn underground railway, tram, bus and ferry networks, but not the S-Bahn urban rail system, which is operated by the Deutsche Bahn, the German railway company. Nevertheless, tickets bought in the S-Bahns are valid in the U-Bahns, trams and buses as well, and vice versa. Tickets can be bought for specific or multiple fare zones. You can buy tickets for the combined zones AB, BC or ABC. The tickets for the A and B zones are offered together and are all you need to travel within the city limits. You can choose different tickets, depending on the distance and the duration of your journey. The single ticket is “valid for a single trip with unlimited transfers in a single direction along the standard or scheduled route to your destination. The trip may be interrupted, as long as the maximum 2-hour period is not exceeded”. This ticket is not valid for return or round trips. Short trip tickets includes up to 3 train or subway stations with transfer, or 6 tram or bus stops, without transfers. And the return trip, obviously, is not included. Find here all the ticket options. A general rule: if you are taking more than three trips a day, it makes sense for you to buy a day-ticket. The day ticket is valid until 3 a.m. the next day of its validation. If you need to go somewhere out of the zone you bought your ticket, you can buy an extension for it, valid for 2 hours and only with the main ticket. But attention: extension tickets are not possible for Welcome Berlin Card holders. You can buy the tickets on the machines located on the train platforms, inside the trams or directly with the bus driver. On the machines, you can select the language: German, English, French, Polish, Spanish and Turkish are available. And credit cards, on the machines on the train platforms, excepted American Express, are accepted. In Germany, there are no ratchets in the stations, which can give you a false impression that the public transport is free of charge! You will probably see passengers getting into the trains without a ticket. Residents normally choose to pay for a monthly or an annual ticket. So buy your ticket and don’t be a Schwarzfahrer! And very important: Don’t forget to stamp your ticket before you get into the train. You find the stamp machine next to the ticket machine. There are random Kontrollen inside the trains and trams. Fare inspectors have the right to demand to see each passenger’s ticket and don’t wear a uniform. They will identify themselves showing an ID as soon they announce the ticket checking. Passengers found without or with an expired/invalid ticket for travel in the tariff zone ticket are fined 60 euros! Along with the S-Bahn, a network of train lines, the U-Bahn serves as the main means of transport in the capital. The U-Bahn system, which comprises 9 metro lines and 173 stations, runs within the city borders and it is mostly underground, with some sections on elevated tracks. The charming yellow trains run every two to five minutes during peak hours, every five minutes for the rest of the day and every ten minutes in the evening and on Sundays. The trains start running from 4h30-5h00 until 0h30 during the week. If you miss the last train, don’t worry: there are night buses replacing the major metro lines, running every 30 minutes and stopping on each metro station, as the U-Bahn does. Therefore, one night bus runs parallel to each U-Bahn line during the week time closing hours. On the weekends (until Mondays 0h30) and on public holidays the trains run overnight, without interruption, every 15 minutes. The S-Bahn system is the overground (for the most part) rail system, with 15 lines serving 166 stations and has a longer average distance between stations than the U-Bahn. The trains also serve some of the closer suburbs in Brandenburg. Two of the most iconic lines are the Ringbahn, the circle line, that carries the S41 (clockwise) and S42 (anticlockwise) lines and the so called Stadtbahn, carrying the S5 (Strausberg Nord to Spandau), S7 (Ahrensfelde to Potsdam) and S75 (Wartenberg to Westkreuz) lines. The Stadtbahn runs through Berlin from east to west. From Ostkreuz to Westkreuz, you will pass by many of the most famous landmarks in Berlin, including the Oberbaumbrücke, East Side Gallery, Alexanderplatz, Museum Island, the Reichstag and the outskirts of the Zoologischer Garten. It is a good way to do sightseeing while you commute! The tram lines operate predominantly in eastern neighborhoods. All the tram lines in the former West Berlin were replaced by bus or U-Bahn services after the Second World War. By 1967, there were no more trams circulating in West Berlin. After the fall of the Berlin Wall, a few extensions have been added across the old border. In areas poorly served by the U-Bahn and S-Bahn, tram lines operate 24 hours a day and can be recognized by an M prefix to their route number. Although the trams are not the fastest way to get through the city, they are the best choice to commute in a hot summer day, since they are equipped with air conditioning systems! They are also a lovely way to observe city life while getting from point A to point B. Please note again that the ticket machines inside the trams only accept coins! The bus system in Berlin offers 151 lines spread all over the city, some running every 10 minutes with a 24-hour service. Buses also replace the metro trains during the week time closing hours, running parallel to each U-Bahn station. One of the most scenic lines is the 100 Line. This bus line passes through the most famous sights of Berlin. Go to Alexanderplatz and hop on the double-decker bus line 100. You will be able to admire Unter den Linden, the Museum Island, the Brandenburger Tor, the borders of Tiergarten, Ku’damm and the City West, until its terminus at the Zoologischer Garten station. Berlin also offers hop on-hop off sightseeing buses. You can hop on the bus at any station of the tour, hop off at a station of your choice and continue the city tour with the next bus on the course. The main ports of Berlin handle the shipping of heavy goods and are not used for public transport. Nevertheless, sightseeing boats operate on the central section of the Spree river and on its adjoining waterway. There are short tours on the Spree, in the city centre, and a three-hour circuit of the city centre via the Spree and the Landwehr Canal. It is definitely worth it! A great way to admire the main sights of Berlin from a different perspective! Stern und Kreisschiffahrt offer daily boat tours from one hour, including 90 stops! Other boat tours operators can be find here. There are also 6 passenger ferry lines routes, many of them linking lakes and canals. One of the most beautiful is the F10 crossing the Wannsee lake, from the S-Bahn station Wannsee to Kladow, in Brandenburg. The trip takes 20 minutes and the boats depart every hour. The view to the Havel river and to the Wannsee beach is stunning! Berlin has one of the lowest numbers of cars per capita in the Western world. There are only 377 cars per 1000 residents. With its wide streets and avenues, Berlin gives the impression of being in a permanent public holiday rhythm, especially if you compare its traffic situation to other big cities in world. If you choose to move around Berlin by car, you can opt for renting a car or using a car sharing company. All the major international car rental firms have offices in Berlin. The two airports and the Hauptbahnhof have car hiring desks. You can compare different operators, its prices and reserve your desired car directly online via the Car Hire Market website. The car sharing systems are getting bigger and bigger in Berlin. The two main car sharing companies operating in the German capital are car2go and DriveNow. Both firms offer new cars for (very) short-term rentals to circulate around Berlin. The two companies offer free apps, available on Android and iOS, letting you know all the available cars around your area on a map. Car2go is cheaper than DriveNow: the basic model car costs you 26 cents per minute (DriveNow charges you 31 cents for a not-so-basic model car) and the validation fee costs 9 euros. DriveNow charges you 30 euros for the registration fee. All the payments are taken by credit card. And, of course, a valid drivers’ license is required to sign up for the service. The Tegel and Schönefeld airport areas are covered by the DriveNow and car2go, but you need to pay an additional fee if you choose to park the car on that area, since there are specific fees for parking the car outside of the home area. However, you can park the car anywhere within the Ringbahn. You can find a comparison between the two services here. Also, other car sharing services can be easily compared here. You don’t need to have a motorbike license to use one of the e-scooter sharing services in Berlin. It is enough to have a valid drivers’ license. Coup and Emmy are the two main e-scooter sharing companies serving Berlin. They operate in a similar way as the car sharing firms: you download their app and proceed to the validation of your documents. Then, you are able to find the nearby scooter. And good news: there is no registration fee! Coup charges you 3 euros for each 30 minute ride and Emmy charges you by minute (19 cents) or by distance (59 cents), making it the cheaper option for short commutes. It is also possible to rent them for the day. For more details on their services, our friends at Exberliner made a complete guide about them! Berlin offers more than 7,000 taxicabs, easily identified by their beige/ivory color. Since 30 June 2015, the base fare is 3.90 euros and each of the first 7 kilometers costs 2 euros. The subsequent kilometer costs 1.50 euro. Knowing these prices, you can estimate your fare before getting into the taxi. Waiting in heavy traffic will normally not affect the fare, as the meter does not account for time until after a two-minute delay. Tip: In Berlin taxis have a special low fare (5 euros) called “Kurzstrecke” for distances less than 2 kilometers, without interruption. Be sure to tell the taxi driver that you want a “Kurzstrecke”. You can get a free taxicab hailing on the streets, ordering one via a call-a-cab line or via an app, like mytaxi (you can even pay the ride via the app). In Berlin, Uber uses the official taxi fleet and has the same rates as a normal cab. It should be possible to pay your fare by credit or debit card in any taxicab. And don’t forget to ask for a receipt. It will allow you to identify the vehicle you travelled, in case you accidentally forget something in the car. For some CO2 saving, cycle rickshaws are the best option, especially in the warmer months. You can easily find them vacant around the main tourists spots in Berlin. Bike Taxi and Velotaxi are the major companies in the German capital. The prices are hefty: the first kilometer costs 7 euros and each additional kilometer, 5 euros. If Berlin has not so many cars, the opposite applies to bikes: It is estimated that Berlin has 710 bicycles per 1000 residents, meaning almost 2.5 million bikes! 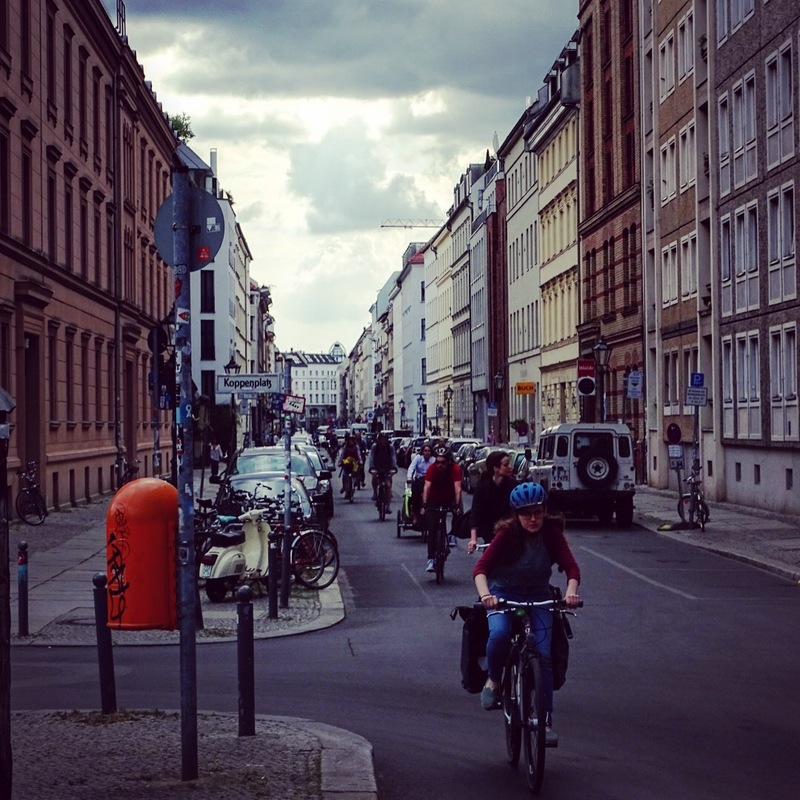 There are hundreds and hundreds of bike lanes, bike paths, shared bus lanes and off-road routes, including the Mauerweg, the circular trail that traces the way where the Berlin Wall once stood. There are also the so called Fahrradstrassen (bicycle streets) where bikes have priority and vehicles are limited to 30 Km/h. Even though Berlin is not Copenhagen, cycling in Berlin is definitely the quickest way from A to B. Despite the signs on the ground, at the end of certain bike lanes, sometimes you can get lost, without knowing if you should take the street or continue on the sidewalk. Overall, on the main roads, the bike lane structure is quite good, but we need to say that improvements and conservation works should be done. Notice that in Germany, the bike riders must obey the same rules as the car drivers. This means: respect the red lights, don’t ride using your smartphone and, most of all, don’t go on the wrong way, either on the streets or on the bike lanes! Besides the police cars, Berlin has police officers riding on bikes around the city center. They will give you a fine that can reach more than 100 euros if you don’t follow the traffic rules. In case your friend is not riding a bike or in case of heavy rain or snow, to avoid getting soaked, you are allowed to carry your bike on the S-Bahn and U-Bahn trains, on trams and on night buses. You will need to buy an additional ticket for your bike. And don’t forget to look for the sign that marks the bike-friendly wagon. Normally, the trains (subway or suburban trains) have two wagons, with fewer seats, designed to carry bikes. Finally, be sure to have a good lock to use to park your bike. And if it is possible, avoid leaving your bike on the streets overnight. Some bike shops offer bikes for rent. If you stay in Berlin for more than a couple of days, renting a bike for a week is definitely cheaper. There are also bikes for rent at most of the Spätis for 12 euro/day. Check the Berlin and Bike website for the details. BikeSurf is a bicycle sharing project, enabling free trust based bike borrowing. Even though the nextbike fleet is smaller than the one of its competitor, both firms apply similar prices: 1 euro for the first 30 minutes. You can return the bike to one of the stations or leave it at any main street or junction within the Ringbahn, for an additional fee of 50 cents. If you park it outside the circle train line, a fine of 20 euros, plus 2 euros for each Km the bike is remote of the “flex zone” is applied. They have different registration fee systems and daily pass rates. Exberliner also did a complete review of the main bike sharing systems available in Berlin. Check it here. Berlin is very flat and an amazing walkable city. The large sidewalks and the buildings façades of Charlottenburg, Prenzlauer Berg or the Bergmannkiez make for a pleasant stroll for the “flâneurs”. It is also the perfect way to appreciate all the details of the amazing street art in Berlin. 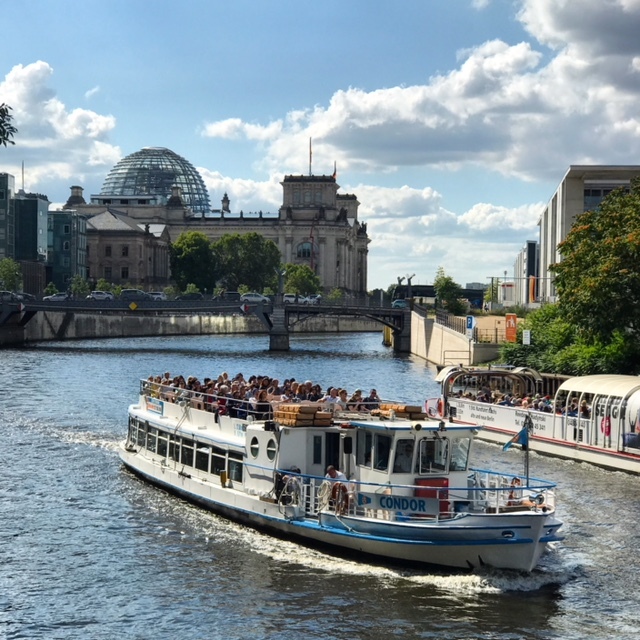 If the plethora of transport modalities Berlin offers is not enough for you, we selected some of the most picturesque ways to get around the city. The list includes nostalgic horse-drawn carriage rides, Berlin horizontal, which is perfect for hot and starry summer nights, Segway tours, beer bike tours, the party tram Berlinerfahrbar, hot rods tours, and for the old timer lovers, Trabant tours, the exotic Trabant-XXL limousine, Beetle tours and Bulli (VW Bus) tours. If you would like to explore the subway system on a cabrio subway car, read this article we wrote about it! Berlin also has its first cable car! Built especially for the International Garden Fair 2017 (IGA) the 1,5 Km long cableway cross the Erholungspark in Marzahn (northeastern of the city), next to the Gardens of the World. Exhaustive detail, wow! Very thorough and well-explained.